Father Joseph Pesola, a retired priest of the Archdiocese of Indianapolis, died on July 22 at Community North Hospital in Indianapolis. He was 52. Visitation will be held from 4-6 p.m. on July 29 at Seals Funeral Home, 122 W. Staat St., in Fortville. A vigil service will be held at 6 p.m. after the visitation. The Mass of Christian Burial will be celebrated at 11 a.m. on July 30 at St. Thomas the Apostle Church, 523 S. Merrill St., in Fortville. Archbishop Charles C. Thompson will be the principal celebrant of the Mass. Burial will follow at Our Lady of Peace Cemetery in Indianapolis. Father Pesola was born on Aug. 15, 1965, in Elkhart, Ind. 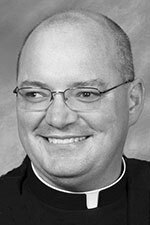 He obtained his masters of divinity from Sacred Heart School of Theology at Hales Corner, Wis., and was ordained in 1997. His longest assignment was as administrator of St. Thomas the Apostle Parish in Fortville, serving from 2002-12. Prior to that, he served in Indianapolis as an associate pastor for eight months at St. Pius X Parish, for two years at Christ the King Parish, and as part-time associate pastor for nearly a year and a half at St. Barnabas Parish. While serving at St. Barnabas, Father Pesola became part-time chaplain for the archdiocesan apostolate for the deaf community in 2001. “I really think that [ministry] was his calling within a calling [to the priesthood],” said Father Gerald Kirkhoff, archdiocesan vicar for advocacy of priests. “He tried to bring the deaf community into the Church, and he tried to educate the Church and the laity on [the deaf community’s] role in the Church. Stephanie Garst, choir director at St. Thomas the Apostle Parish, agreed. “He had a great passion for those who could not hear,” said Garst, who became choir director when Father Pesola became the administrator of the Fortville parish. “And he had a real passion for those who had a tough time. He spent time [ministering] out at the juvenile center at Pendleton, and also went to the maximum security prison. “He loved kids. He liked hanging out with them, and spearheaded our parish sending youths to NCYC [National Catholic Youth Conference]. Garst noted two of Father Pesola’s favorite pastimes: reading and spending time with his family. “He loved to read and was very knowledgeable,” she said. “He would buy books on every religious subject he could find. Due to health issues, Father Pesola was reassigned in 2012 to live in residence at St. Lawrence Parish in Indianapolis, where he assisted with sacramental duties. He was granted early retirement in 2014 for medical reasons. Like Father Munshower, Father Kirkhoff was struck by the late priest’s determination toward the end of his life. “He didn’t give up. He tried hard to get better and kept fighting,” says Father Kirkhoff. Father Kirkhoff spoke of concelebrating a Mass recently with Father Pesola while visiting him at Westminster Village in Indianapolis. Garst also noted Father Pesola’s desire to celebrate the sacraments. Father Pesola is survived by his parents, Harold and Pam Pesola of Elkhart; his sisters, Joyce McGuire of Elkhart and Lauri Flowers of Goshen; several nieces and nephews and a grand‑nephew.